WordPress is a state-of-the-art blogging platform with a focus on aesthetics, web standards, and usability. WordPress is also one of the web's most popular content management systems (CMS). cPanel includes an automatic installer that you can use to set WordPress up on your domains for you. This article is provided as a courtesy. Installing, configuring, and troubleshooting third-party applications is outside the scope of support provided by (mt) Media Temple. Please take a moment to review the Statement of Support. (mt) Media Temple only supports the basic operation of the automatic WordPress installer in cPanel, not the WordPress application itself. Additionally, it is possible to install WordPress manually without enabling cPAddon function for it, or going through these steps. You can still download and install WordPress from the WordPress website. For more information, read the installation instructions on the WordPress website. Please note that the WordPress version used in the guide below may not reflect the most recent version available. Watch this video to learn how to install WordPress using cPanel. Log into WHM using your root login credentials. Search for cPAddons, using the responsive search tool in the upper-left of the panel. Find the Install cPAddons Site Software menu. 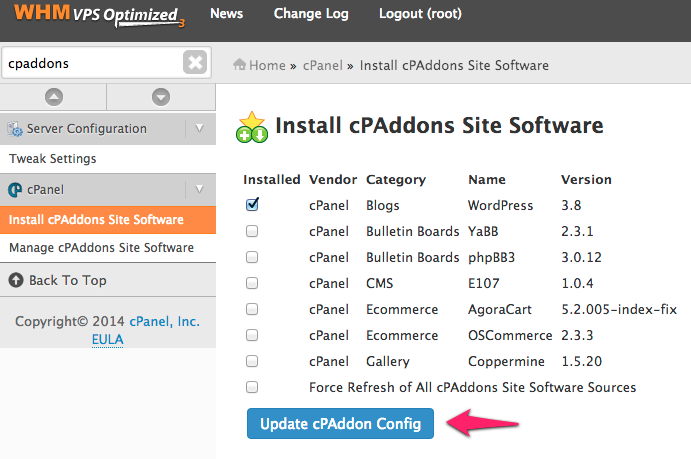 Once the configuration update completes, head to the Manage cPAddons Site Software menu. 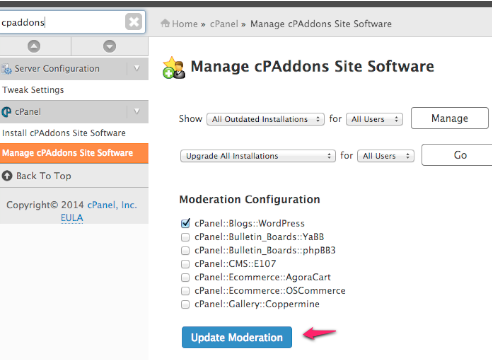 Make sure that the box next to cPanel - Blogs - WordPress is checked, and click Update Moderation. 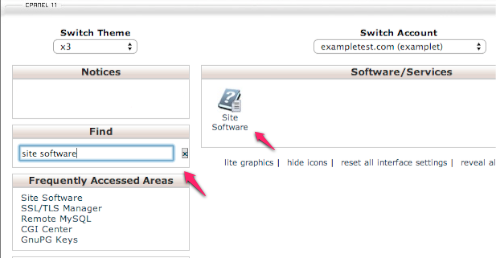 Now WordPress is ready to be installed on your site using cPanel! From here, you'll want to log into cPanel for your domain and search for the Site Software menu. You can use the find feature to make this easy. From the Site Software menu, select WordPress. You can also choose to receive notifications when automatic updates are available for the program from this menu. From here, you'll want to set up your WordPress install, and then click Submit Moderation Request. Admin User - This is your WordPress administrative user. 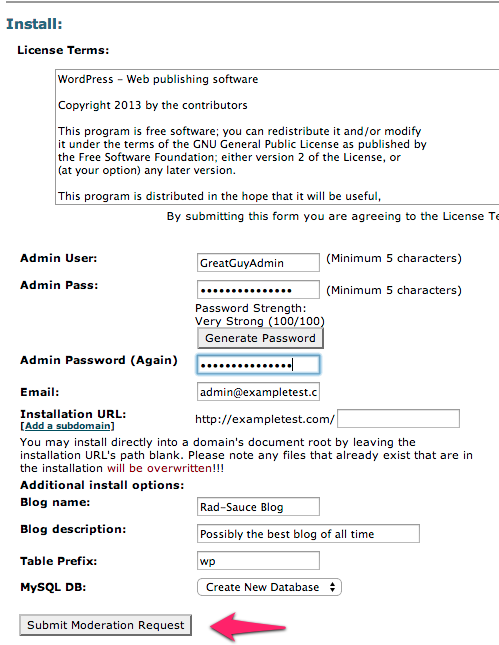 Admin Pass - Set your WordPress administrative user password. Email - The email address associated with the WordPress admin user. Installation URL - This is setting the home page your WordPress site will reside at. If you'd like to install it on the parent domain, leave this area blank. Blog name - The name of your WordPress site. Blog description - A quick line to describe your new site. Table Prefix - This determines the database table prefix to be used for your WordPress site. You can leave this as default, or edit it for easier identification later. MySQL DB - Here you can select the database to be used for your WordPress site. We highly recommend creating a new database for each site, to avoid your websites interfering with one another. On the following page, click Submit Request. Next, you'll want to log back into the WHM panel, and head back to Manage cPAddons Site Software to approve the request. WordPress should now be installed!